Microsoft has announced a new Xbox One update for insiders. The latest update for Xbox One brings new features and improvements to the console. According to the Mike Ybarra (Corporate Vice President – Xbox & Windows gaming platform), – This release is the next major update for gaming on Xbox One and Windows 10 PC and is designed to make the Xbox gaming experience more fun, personalized, and social than ever. We’ve heard feedback from our fans that they want the ability to customize Home the way they want. This new experience on Xbox One gives gamers more choice and delivers fun faster. Updates to Home, Guide, and Community are available today, with updates to Avatars, Game Hubs, Profiles and more coming this fall. Windows 10 PCs will also receive updates to the Game bar and Gaming settings menu. Customize Your Home: The update comes with a new Home on Xbox One. The update also added Microsoft Fluent Design; the look, feel, and movement of the dashboard has been updated to focus on speed, customization, and expression. Now, customize your Home screen to be uniquely yours, and view all the things you love at-a-glance. In this release, the wait between Home, Social, and My Games and Apps is eliminated by consolidating them into one dashboard experience. Effortless Guide Navigation: With this update, it’s faster than ever to switch between tabs in the guide so you can join friends, broadcast, switch between apps, and get back Home. New tab flyouts make it easier to see more content quickly, too. The new Guide layout quickly gets you to the stuff you care about, so you never miss a moment. It’s now even easier to switch between apps or get back to Home, and the new layout will enable you to quickly jump to different tabs using the left thumbstick, d-pad, or bumpers on your controller. 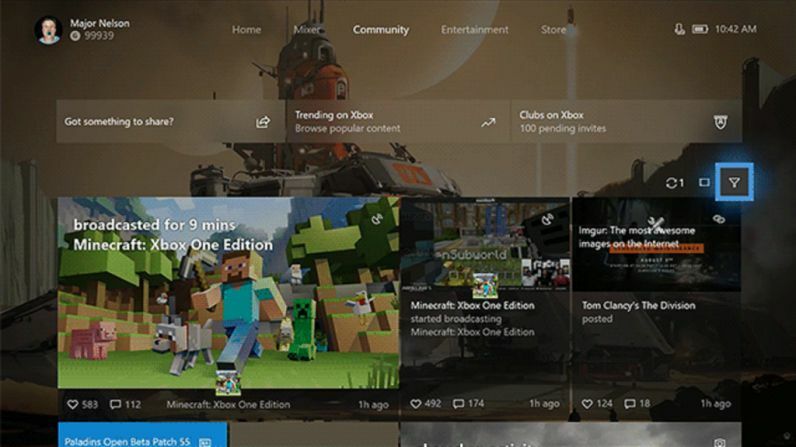 A More Immersive Community: With the latest Xbox One update, the community section has an entirely new Activity Feed layout, showing more content at-a-glance. When looking at feed items in detail, they are presented in an immersive, full-screen view—sharing the experience just as it was captured. Reading comments is now much easier since the comment window can be expanded to fill the screen. You’ll now be able to skim the feed quickly or lean back on the couch and walk through it in detail – it’s entirely up to you. This makes it easier than ever to stay current with the games and friends you care about. Game Hubs, Profiles, and Clubs are also refreshed to make them more dynamic and engaging than ever before. Game Bar Gets Even Better: Mixer broadcasting with the Game bar will now give you more choices on the audio you broadcast. A new settings option will let you choose to broadcast game-only audio or system-wide audio. The latest update also added a new Xbox Live Network Troubleshooting option to the Settings menu in Windows 10, which will help you track down connectivity issues and optimize your online multiplayer experience. The company will roll out plenty of new features in the coming months across Xbox One, Windows 10 PC, Mixer, and mobile devices.